Brought to you by the following Official Proud Sponsors: Town Of Shelburne, Abiding Place Fellowship, Shelburne Town Pharmacy, Shelburne Home Hardware Building Centre, Dalton Electric, Shelburne BIA, , John's No Frills, The Shelburne Transporter, Shelburne's Royal Canadian Legion, Google & YouTube. "Come beat the heat in our Air Conditioned Lounge and if you have never been here before ask the Bar Stewart for a tour and see what all the fun is. Membership applications are at the branch. The rules on membership have changed recently, you do not need to be in the service or have a family member that was to join. You simply just fill out the application and our Membership Chairperson will call for a quick interview. Then our Membership will vote on the acceptance of the application at our General Meeting. The Legion is run primarily by volunteers including the Executive and the President. Volunteers are always needed to help with the events. We will be posting our Volunteer lists soon for the Heritage Music Festival from Aug 10th - 13th. This particular event requires a lot of help. So please come in and sign up for a position you would like or just leave your name and number with the branch. This Friday is Red Friday Wing Night, introducing Visual Negative as the entertainment. Wings are sold from 6pm - 10pm you can eat in or take out. We will be taking a little break at the end of the month and will NOT be having wings on Friday July 28th. "Pickin in the Park" is at Fiddle Park on July 28th & 29th please help support this event. For more information contact Holmes Appliance. July 29th from 1pm - 4pm we will be having a Super Bingo with prize pay outs of $150 and a jackpot of $1,500.00 in honor of Canada 150. Thank you as always for all of your support. " Lesa Peat. As seen featured in the photo below (L to R Front) The Executive Board Members of the Shelburne Royal Canadian Legion gathered for the last board meeting before summer break. As seen featured in the photo below (L to R Front) Executive Branch Padre, Reverend Gord Horsley, Executive Entertainment Chairman, Dave McIntyre, Second Vice President , Membership Chairperson, Bingo Chairperson, Linda Orvis, President, Lesa Peat, 1st Vice President, Sergeant At Arms, Service Officer Cadet Liaison, Garry Netzke, Executive Bursary Chairperson, Mary Warman, (L to R Back) Past President, Sports Officer, Senior Officer, Ross Warman, T.O.D Chairperson, Honors & Awards Chairperson,Ways & Means Chairperson, and Bylaw Officer, Jill McIllwraith, Executive Secretary,Trish Brolly, Youth Education, Babs Defoe(Absent from Photo), Executive Public Relations Officer, Maintenance, Philip Norris. Click Image (L) to see video of The Shelburne Royal Canadian Legion In the Commemorative Ceremonial March to The Cenotaph Marking Their 85th Anniversary! And The Winners? (Below) Photo Courtesy of The Royal Canadian Legion Facebook Page. three student winners & Garry Netzke, 1st Vice President. Photo generously provided. The Competition was held on February 26, 2017 and was a huge success. Life Membership Award Presented To Linda Orvis, 2nd Vice President of The Shelburne Royal Canadian Legion.
" Congratulations to 2nd Vice President Linda Orvis. Linda has been a member of The Royal Canadian Legion for 41 years and has held many positions with Branch 220. It was with great Honour and Pleasure to be able to present her with the well deserved Life Membership award. Linda received this award in front of packed room of her piers at our General Meeting of February 28th, " Lesa Peat, Shelburne Legion President. (Lto R) Legion President, Lesa Peat, Linda Orvis, 2nd Vice President and Garry Netzke, 1st Vice President. Photo provided by The Shelburne Royal Canadian Legion Facebook Page. Silent Auction At Shelburne's Royal Canadian Legion Helps Provide Local Youth Bursaries In Order To Achieve Secondary Education Goals. (LtoR) Kim Hall and daughter, Kaitlin Huffman paid a visit to the Silent Auction Held At Shelburne's Royal Canadian Legion on Saturday February 25, 2017. Torchlight's TeleCheck- Dufferin Services Manager, Katherine Johnson visited with Shelburne Royal Canadian Legion Veterans explaining the benefits to their unique service providing daily Check-In calls to seniors 55 years and older. As a support to those living with Dementia, Telecheck is also a great comfort to families on vacation, providing reminders to take medications, meals, exercise and the exchange in communication encourages general health. With a quick link response to emergency services, this important social connection is free. There are no referrals for this service, no assessments are required, and with no fee, the service is a wonderful way to stay connected. Located in Orangeville, this Telecheck service is a member of the Torchlight organization, a non-profit funded by the Ontario Ministry of Health. Telecheck-Dufferin can be reached at 519-415-3764. Click image above (L) to visit their website for more information. Anyone interested in joining the weekly Veteran Meetings can call the Shelburne Royal Canadian Legion (519) 925-3800 or visit each Wednesday at 10 a.m.
Click on image (L) to see video of Shelburne Air Cadets 164 Squadron Change Of Command Ceremony November 2016. Missed other Shelburne Air Cadets Events? for photographic and video coverage. And Shelburne's Royal Canadian Legion 220 Branch Helping To Support The Dream! IT'S THE GOOD STUFF! Centre Dufferin District High School Student's History Program really brings history to life for students raising money for an annual historical trips. This year, students who are fortunate enough to be selected will travel to Europe for the 100th Anniversary of Vimy Ridge in April 2017. Student Eden Galbraith received a generous boost towards her achieving her $5000 goal, earning and volunteering with the Shelburne Legion during events. Raising $440, Galbraith was presented the check during the Shelburne Legion's Annual Volunteer Appreciation Dinner held on Sunday, September 25, 2016. Galbraith has raised $2000 towards her once in a lifetime trip and still needs to raise more. If anyone is interested in donating or has a fund raising event idea in support of Galbraith, contact Eden's mom, Julie Galbraith at 519-215-0905. IT'S THE GOOD STUFF! (LtoR) 1st Vice President Garry Netzke, CDDHS Student, Eden Galbraith, 2nd Vice President, Linda Orvis, and Shelburne Royal Canadian Legion, Branch 220 President, Lesa Peat. Click on image above to see The Annual Volunteer Appreciation Dinner of 2016 photographic coverage. Update Shelburne's Hometown Heroes Banner Intiative From Shelburne Mayor, Ken Bennington. ""Our goal was to have 20 flags in our first wave to honour Shelburne's very own veterans. We are soooo close with only a few spots to fill, and 2 weeks until our deadline. Our committee met last night, and I had a chance to view some of these photos. If you have a loved one who served, please contact me. Same goes, if you would like to sponsor a flag of a veteran you may have never met." "I can't say it enough. This past weekend was great, we had not one issue at the branch the entire weekend. Our Volunteers were amazing and did a fantastic job. Our Bar staff did a great job all weekend. The crew that was working on the back bar worked overtime to have us up and running for August 5th. Thank you to Waterloo Brewery, Labatt's, Molson's, Shelburne LCBO, Shelburne Home Hardware, Kevin Hill and Sysco Foods, The 124 Market, No Frill's, Shelburne Free Press, Shelburne Freelancer, Foodland, The Chipwood's Band, Cindy Lou, Dufferin County Line Band, The Camp Fire Poets, Trevor Downey, Robin Pickett and the Pipe Bands. and the Sunday afternoon jammers for your continued support. Lastly to the citizens of Shelburne and guests it was a pleasure serving all of you. This Friday night is Red Friday Wing Night with DJ Jerry Daniels. Sunday August 14th is our monthly breakfast from 9 - Noon." Lesa Peat, Shelburne's Royal Canadian Legion President. 66th Canadian Open Old Time Fiddle Championship 2016. Thursday Aug 4th we will be having a Meat Spin with Steak and Pork from 7pm - 9pm. Friday August the 5th we will be serving a Hot Beef Sandwich with potatoes and coleslaw for $10 from 4pm - 8pm. At 8pm The Chipwood's Band will be performing in our Museum Room and The Dufferin County Line Band will be in the Warriors Hall. We will be serving "Pub Fare" from 8pm - 12am with Hamburgers, Sausage on a Bun, Hot Dogs, French Fries and Onion Rings. Saturday Aug 6thwe will be serving Breakfast from 8am - 12pm. There will be a BBQ on William Street from 12pm - 4pm. Cindy Lou will be out on the Patio entertaining and Waterloo Brewery will be here with some hand outs. The Pipers will be performing on the patio after the Parade. From 4pm to 8pm we will be serving a Roast Beef dinner with Baked Potato, Corn on the Cob, coleslaw and desert fro $12.50. Pub Fare will be served from 8pm - 12am. The Camp Fire Poets will be performing in the Warriors Hall from 8pm- 1am. Sunday August 7th we will be serving Breakfast from 8am - 12pm. We will be serving bacon or sausage and introducing our Hungry Man Breakfast. Adult $7, Child $4 and Hungry Man $10. Thank you in advance to all the wonderful volunteers that will be helping make this a great event. Branch 220 President, Lesa Peat. "Thank you to IK World Trading for the donation of the new bar top. It is now in preparation by Dan Pellerin and soon to be finished by Brent Young. Thank you to Sandy Haron and Home Hardware for your assistance in colors for the new bar and the Warriors Hall. Garry and Martin have been painting diligently. I have been in contact with all the suppliers involved in the project and am happy to say that we will have 6 varieties of draft on tap. We are waiting for the refrigeration units to be installed this week by Thermotech and Draft Services. Next week will be all the finishing touches and open for business on Friday August 5th. This Friday July 29th is another Red Friday wing night with the all request DJ Rob Martine. Wings will be held in upper hall and lounge. This is a much smaller area, so we please ask that all children remain with their parents and no strollers in the building. Sorry for any inconvenience," Shelburne Legion President, Lesa Peat. 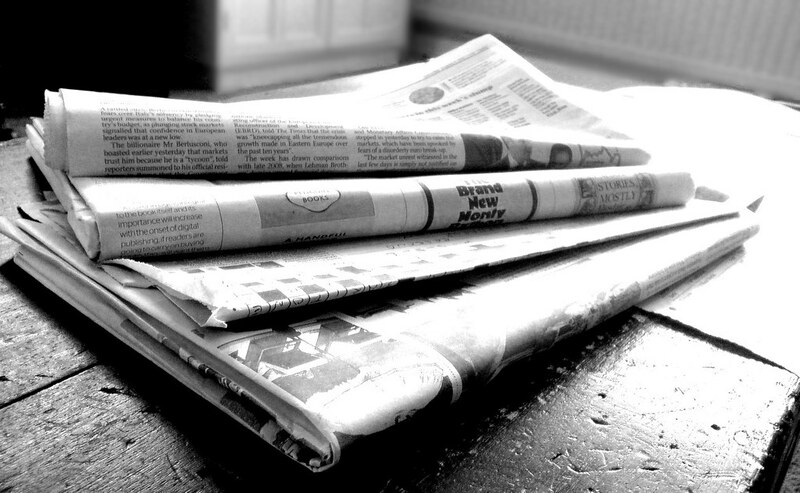 Weekly Update from Shelburne's Royal Canadian Legion President, Lesa Peat. "This week we are still in Reno. mode in the back kitchen but everything is still business as usual. Thursday Euchre is still on at 7:00 pm and for the next wing night on Friday July 29, we will have DJ Rob Martine. Don't forget our troops and wear red on Fridays. Stop by and say hello and share your story." Some friendships remain true for lifetimes as in the case of these three Toronto Islanders, long time friends who grew up together. (LtoR) Bill Peat, brother of the Shelburne Royal Canadian Legion 220 Branch President, Lesa Peat and Performer, Tim Bovaconti of the Tim & Pat Duo, enjoyed Wing Night at the Legion coupled with the Band's live performance. 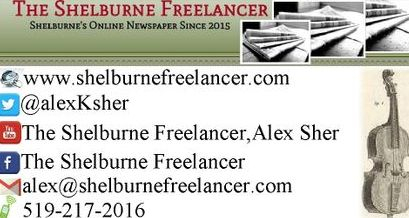 Click on image left to visit the Shelburne Legion Photo Gallery for more Photographic highlights from a wonderfully entertaining evening. Click on image (R) for video of the Tim & Pat Duo who performed live at the Shelburne Royal Canadian Legion 220 Branch on Friday, July 15, 2016. WWII Veteran Jim Lennox Recieved His Quilt of Valour. Click on image (R) to find out what the quilt means to him. "I am honoured to be a part of the Shelburne Hometown Heroes initiative. I have just returned from our inaugural kick-off meeting, a joint effort between the Town of Shelburne and the Royal Canadian Legion Br.220. 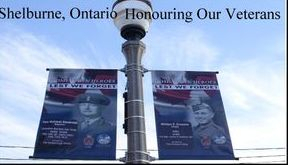 Our goal is to be ready for Remembrance Day 2016 and proudly display some of our very own "Hometown Heroes" from our downtown light posts. We would love to hear about your loved one's military service for our great nation, whether it be past or current, male or female, living or deceased. You can contact me or our committee to see how your family can sponsor a flag. I will provide more details once they become available.